Jason Vincent (l.) Josh Perlman and Ben Lustbader, the partners behind Giant. LOGAN SQUARE — Giant, opened by former Lula Cafe chefs in 2016, is continuing to make waves in the foodie world. The petite, 40-seat restaurant at 3209 W. Armitage Ave. ranked No. 6 on Bon Appétit's "Hot 10: America's Best New Restaurants 2017" list, the magazine announced Tuesday morning. 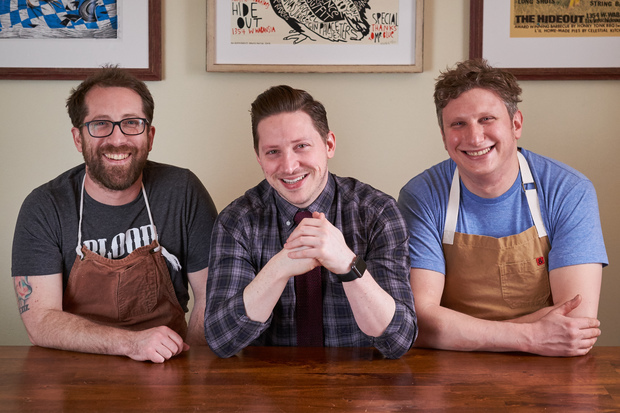 It's a, shall we say, giant accomplishment for restaurant partners Jason Vincent, Ben Lustbader and Josh Perlman. “When we were opening, Josh, Ben and I all got together on my back porch and talked about our personal goals. We all knew we wanted a place that would offer a 'two hour break from the craziness in the world'…and I think that’s what we got," Vincent said in a prepared statement. Giant serves elevated Midwestern fare with a focus on farm fresh vegetables. The restaurant has scored glowing reviews from dining critics at the Tribune and the Reader. The only other Chicago restaurant to make Bon Appétit's 2017 list was Elske, 1350 W. Randolph St., in the West Loop, which ranked No. 2. Earlier this month, Giant chefs opened a new restaurant, City Mouse, in the new Ace Hotel in the booming West Loop.